I just wanted to make everyone aware of this forum member. He sold me a made in Japan N4. Here is his posting, http://www.washburn.com/forum/topic.asp?TOPIC_ID=13429&SearchTerms=mij,n4. As you can see, the post states hard case included. I also received an email from him stating that is was indeed a hard case. It arrived in a cheap gigbag. He also sent me pictures of the guitar, showing the strap buttons and a certain type of Floyd Rose. It arrived with no strap buttons, and a different bridge. When I asked if there were any problems with the guitar, he said no issues at all. Well, I plugged it in, and the pickup selector didn't work. I opened the cavities on the back of the guitar, and half of the wiring was disconnected. I have a white wire going from the volume pot cavity to the pickup selector cavity, that is completely disconnected. Also, the neck pickup wires are completely disconnected in the pickup selector cavity. 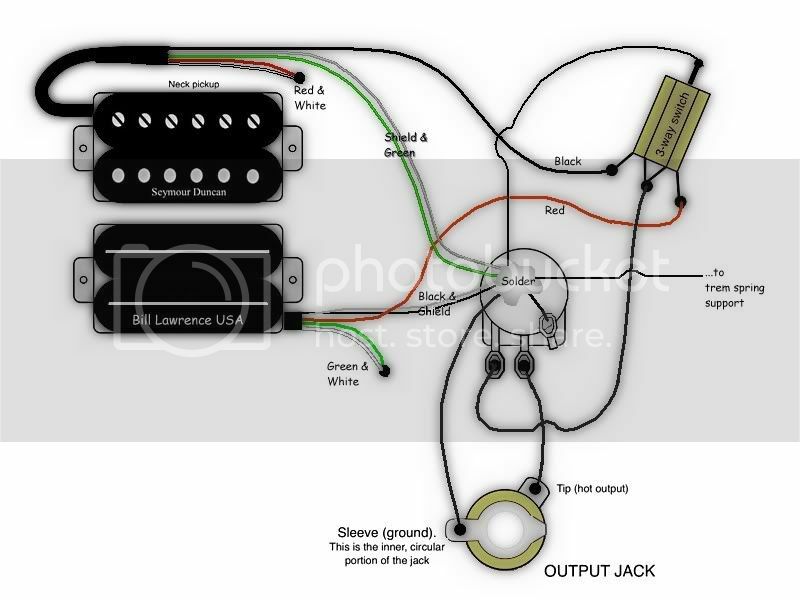 The only wire connected in the pickup selector cavity is a yellow wire going from the center point on the pickup selector switch to the volume pot cavity, where it is disconnected. I've emailed him several times, and received no response. I thought I'd give everyone on here a heads up about him. Also, if anyone could help me out with the wiring, it would be much appreciated. It is a 59 in the neck and a BL USA in the bridge. I made sure to take them out and check. Did you pay with Paypal? If you did, file a claim for safe measure. Even if you get nothing back, do it anyway. Here is the wiring, unless you have a tone knob. Thanks Ayrton. I did file a claim with Paypal. But they said, according to their user agreement, they only deal with shipping problems. This guy had a posting up on here for another N4, http://www.washburn.com/forum/topic.asp?TOPIC_ID=13502. I'm wondering if anyone had any problems with that. Thanks for sympathy Rumpel. Believe me, my head was about to explode while I was writing my post. I'm really surprised to find that PayPal ONLY covers the shipping. I'll have to reconsider how I do business now. And... sorry you had that trouble. Thanks for the tip! Well guys, I got it wired up. Thanks for the diagram, Ayrton. I played for a bit on my little Marshall combo here at home. Kids are asleep, so I can't crank it. Band practice tomorrow night, so I'll let you know how it sounds cranked. I also ordered a trem stop and a D-Tuna for it, can't wait to get them installed. If anyone knows of a hard case that they are selling, please let me know. My address is ledvedder at comcast dot net. I may have a line on a case as well. What an aweful experience hope you get it all sorted. What was the trem? I have a Schaller Washburn trem I took out my N4 to replace with OFR if you need a better trem. THe Schaller wasn't bad but heard the OFR was better. Give me a shout if any use to you!! Thanks Gilbertfan, it was just a Washburn trem. Sure I'm interested in the Schaller. How much are you asking? Just to warn ledvedder the trem is a Schaller made for Washburn trem so it has Washburn on it but also says MAde In Germany Schaller. Let me check out evilbay as to what people are selling trems 2nd hand and I'll get back to you. There is one there used just now starting bid $50 so I would settle for say $55 and postage. My email is s.cochrane296@btinternet.com let me know if this is suitable or if you want pics of anything and let me know where you are so i could get a postage price for you. My guess is the sinjins**t character will not resurface since he has got rid of his Washburns but if any of you are members of other forum let your mates know!! !